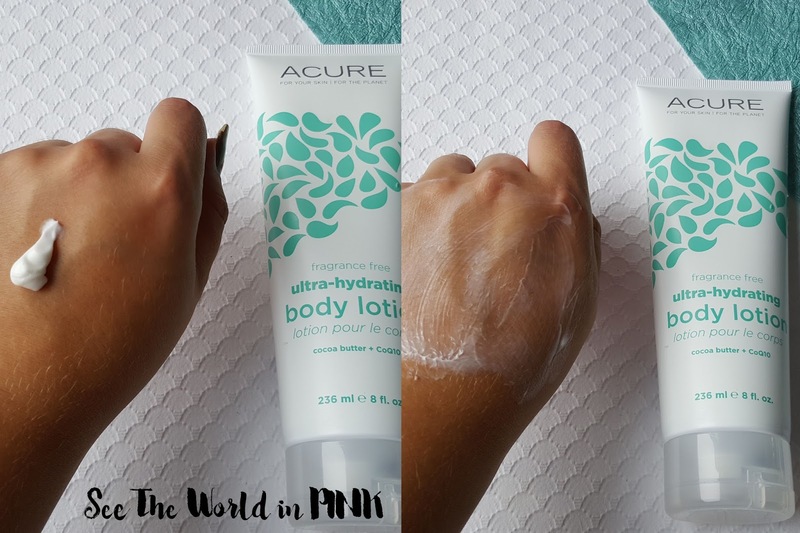 Acure Organics Ultra-Hydrating Body Lotion ~ $9.99 US. Rescue your rough skin with this fragrance free Ultra Hydrating Body Lotion. Fight flaky dryness with a super moisturizing complex of cocoa butter, evening primrose, argan oil and CoQ10. So smooth, you’ll think it’s hitting on you. I have to start by saying how much I love the descriptions on Acure products - they are funny and cheeky! The directions on this lotion say "apply to skin as needed and then ask yourself how you ever lived without this lotion" - with the so smooth comment in the description, I love the confidence in their products! I really liked this lotion and it was nice and thick and absorbed well in to the skin! This offered great hydration and worked all day to keep my skin feeling soft and smooth! I was surprised with all the fruit extract in the lotion that there was no scent at all! There is some really great oil products in this lotion, so give it a little shake before you use it. This lotion smells amazing!!! I love the scent of lavender personally - you will have to like lavender, because this lotion is quite strongly scented! This is a thick lotion, and again absorbs well in to the skin and keeps it hydrated! This has quickly turned in to my go-to after my nighttime bath time - I love the lavender scent for before bed! I know this isn't a lotion per-say, but I think of a correcting balm as a targeted lotion and something to use on really dry, chapped skin - think dry hands and elbows! This is certainly not a lotion texture; it is a thicker vaseline. I didn't even think of using this around the mouth and eyes until I read the website, but I'm not sure with the texture, that I would use it around my eyes personally. I have used this on a few spots, but I really like this on my elbows, and this worked amazing on my knuckles and cuticles (knuckles sound weird but hands get cold and chapped from driving!) It does take a little bit to absorb, but does absorb well in to the skin and doesn't stay slippery! 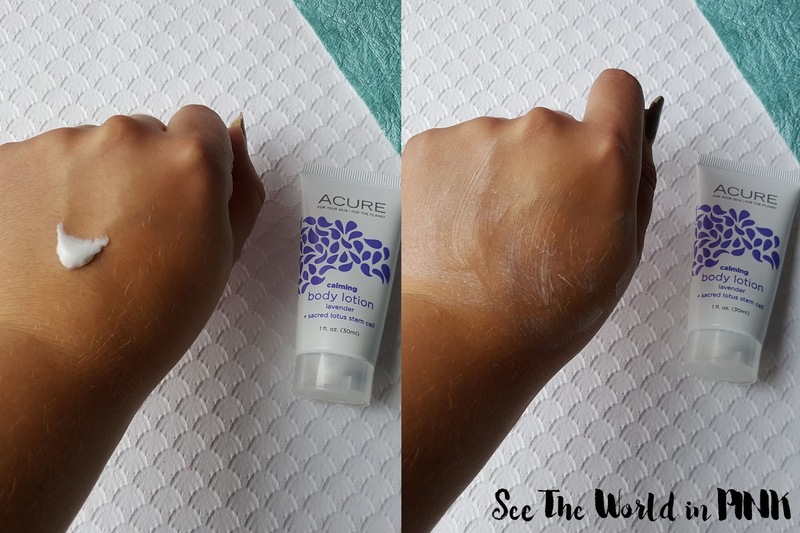 Overall, Acure Organics offer a few different options to help keep your skin smooth and moisturized during the dry, cold Winter months! (Also, any time of the year - but especially right now!) I love that they strive to keep their organic products affordable so everyone can use them! All 3 here are great, but I am especially loving the lavender lotion for bedtime! I'm really enjoying these products too! 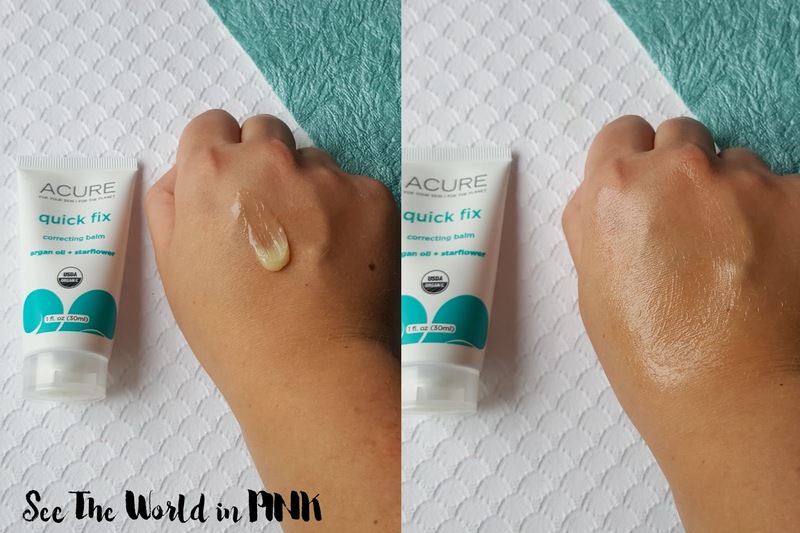 I've been using the Quick Fix on my eyes (on the lines and wrinkles) and haven't had any issues. That's really good to know - I thought it seemed a little to vaseline-y to use on my face, but I'm going to try it now!